MUFE launched its White Definition Instant Brightening Powder Foundation SPF30 / PA++ sometime back last month. I'm a little slow on this, because colour products are easier to get excited about, but every now and then, it's always great to be reminded that even in a slew of attention-grabbing colour products, a good base is paramount. That, and, well, this makeover was really quite something, because it managed to cover my pimples. Initially I was feeling a lot of inertia to write this post, but when I reviewed my crappy I-forgot-to-bring-my-camera-so-I-took-pics-with-my-iPhone photos of the event, I realized that this was reallyl something. So I just had to share it with you guys! MUFE's White Definition Foundation is clearly suited to the Asian market - it's a foundation that aims to give your face a brightened, transluscent, yet natural finish. I got to give the foundation a test run, and even got to try out contouring my face! The demonstration I had had was not just solely to test out the new Instant Brightening Powder Foundation, but also to experience the effects of contouring the face. To be honest, I've never, ever done face contouring, ever (is that enough evers yet?) for a variety of reasons: 1) too lazy, 2) no faith in my own makeup application expertise, 3) I'm actually one of the few people who have given up hope and have just accepted my looks for what they are. But I was interested to give it a go! Surprisingly, a lot of the steps were focused on priming the skin. Which is not a bad idea, because, as you will see a couple of photos down, my skin sure needed lots of priming that day. They actually used not one, but two primers on me. 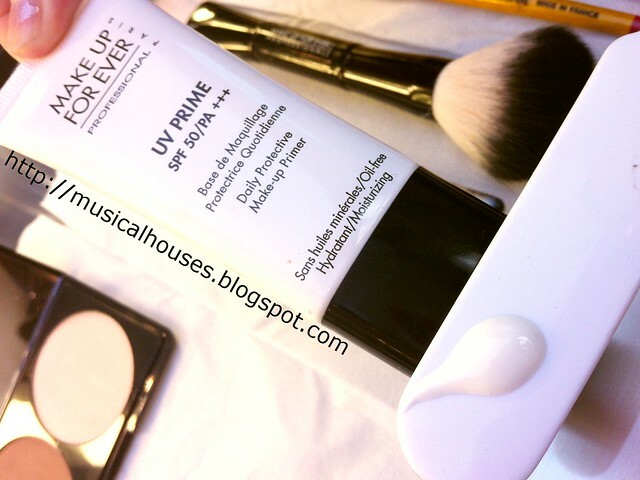 The first was the MUFE UV Prime SPF 50/PA +++, which you see above. From my conversation with the makeup artist, it really functioned, in my case, more of a sunscreen than an actual primer. 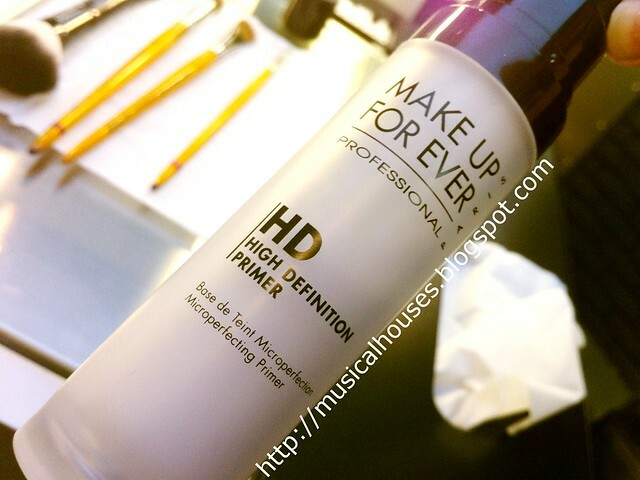 The second primer, which you see below, is the MUFE HD Microperfecting Primer. I think the one she used on me was in white. Because my skin was really bad and blemished that day (thanks to the fact that I went for a facial a few days before this event, and my skin was recuperating from the fact that the facialist was extrecting the heck out of my skin), I needed a lot of concealing. She used the MUFE HD Concealer. 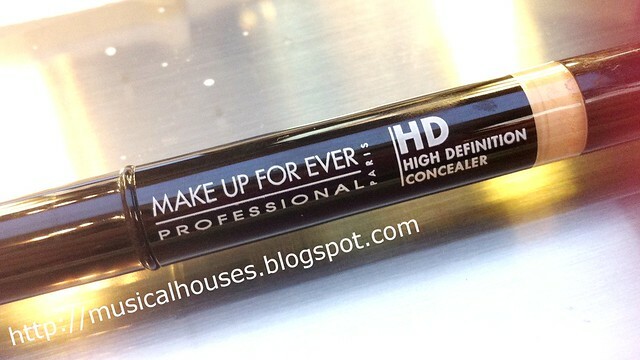 I always had the impression that this was more of an undereye concealer (I mean it comes in that tube-y packaging), but it was used on my blemishes as well, and to really good effect. 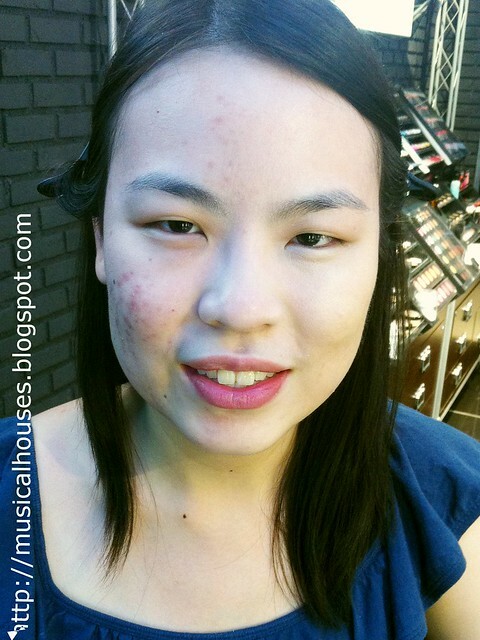 After that, she applied the MUFE White Definition Powder Foundation, and that was it! And when I say to really good effect, that's exactly what I mean. As you can see, my skin was really not in a good state - lots of post-facial swelling and redness. One half of my face had the primers, concealer, and foundation applied. The other side of the face is untouched. Obviously you can tell which side is which, right? Fortunately my skin looks much better now! It's honestly a little (well, okay, a lot) embarrassing for me to post photos of my terrible skin and my less-than-stellar looks (complete with dumbass-not-quite-looking-at-camera-face, no less) for the entire freaking world to see, but this is how I remain an honest blogger. I don't view my blog as an excercise in vanity, collecting only great-looking, photoshopped pictures of myself; instead, I view it as a platform for me to evaluate products honestly and accurately, based on my experiences. So, I guess, photos of me looking pretty are a nice-to-have, not a need-to-have. Sorry, folks. I may be many things, but a model I ain't! But I digress. Yes, as you can see, the foundation does have a pretty nice finish. The lighting isn't perfect (darn indoor store shopping lighting), but it looks natural enough. After that, was the contouring lesson. The MUFE Sculpting Kit in #2 was used, as well as the MUFE Sculpting Blush in #6. You can actually book a one-on-one 15-minute or 30-minute lesson at either MUFE's counter at Sephora Ion and Ngee Ann City, if you call 8381 0760. This contouring lesson I tried is actually one of them, but they have a bunch of other classes, including brow styling, smokey eyes, natural eyes, lashes, complexion, and so on. A 15-minute class costs $15, and a 30-minute class costs $30, so if you want a personalized class focusing on makeup application, this is a great way to do it. For my case, the contouring was around the nose, sides of face, as well as high parts of the face. The effect to me was greatest on my nose area. In fact, I'm so used to seeing my nose as is, that after my face was contoured, I experienced a bit of nose-shock. Below is a photo of myself with my lovely trainer (now that is what I call model-pretty! ), who kindly guided me through the steps. You can see my nose looks really different. I don't really know how I feel about it - I feel like it looks a little strange, and I prefer my pre-contour nose, but then again, I've never ever done any contouring before, so I guess it's normal to feel a little odd at a change. All in all, this demonstration was really helpful. First, I learned that you don't need a billion products to cover your pimples, and secondly, contouring, although utilizing only a dark and light powder, can produce dramatic results. I also was impressed by the coverage of the MUFE White Definition Instant Brightening Powder Foundation. It does . It is now available for $65. The refillable foundation compact costs $20. Oh my that's expensive! BTW can you please upload swatches of the product whenever you get time? Thanks!!! I would have loved to see the contouring up close! If you ever attempt to do it yourself I would love to see a picture of it! The UV primer sounds great. I may have to try once I run out of sunscreen. Babe I was also very hesitant about showing my blemished skin but it is alright. We are not perfect. I like that you are honest and candid about it. That why I like to read your blog, it is about normal girls like me. :) I must say the concealing is fantastic. I must check out that concealer. The contouring effects look really great! I can't pinpoint exactly how but it just makes your features very striking and defined. Yea, I'd love to see a close-up of the contouring as well! wow, it really covered the pimples flawlessly. Excellent. @The Charms: Yup, my skin was looking bad in this photo as I had just gone for a facial a couple of days before and thus still had some redness on my skin! Fortunately my skin is not that bad on a daily basis...it was more of a one-time post-facial thing. Mary Kay products aren't available in this part of the world, seems like it's just a US thing, unfortunately, but thanks for your advice. You're extremely brave in posting your post-facial skin! I could never do that (although I agree with your thoughts and think it's impt for readers to see a NOT-18 year old posting on skincare and cosmetics). Btw, some unsolicited advice. perhaps you can consider not going to the same facialist? My facialist extracts tonnes each time I go to her (coz I go to her once in a blue moon) but the post facial scarring should never look like that!